312 people in our community are currently praying with you. You are ushering in another day, untouched and freshly new, So here I come to ask You God if You'll renew me too? Forgive the many errors, that I made yesterday, And let me try again dear God, to walk closer in Thy way. But Father, I am well aware, I can't make it on my own. So take my hand and hold it tight, for I can't walk alone. Almighty God, I commend to your gracious care and keeping all the men and women of our armed forces at home and abroad. Defend them day by day with your heavenly grace; strengthen them in their trials and temptations; give them courage to face the perils which beset them; and grant them a sense of your abiding presence wherever they may be; through Jesus Christ our Lord. My heart and my flesh cry out for the living God. When Terah had lived 70 years, he fathered Abram, Nahor, and Haran. Now these are the generations of Terah. Terah fathered Abram, Nahor, and Haran; and Haran fathered Lot. Haran died in the presence of his father Terah in the land of his kindred, in Ur of the Chaldeans. And Abram and Nahor took wives. The name of Abram's wife was Sarai, and the name of Nahor's wife, Milcah, the daughter of Haran the father of Milcah and Iscah. Now Sarai was barren; she had no child. 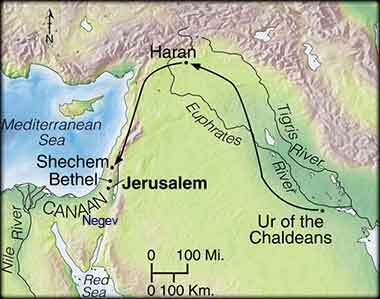 Terah took Abram his son and Lot the son of Haran, his grandson, and Sarai his daughter-in-law, his son Abram's wife, and they went forth together from Ur of the Chaldeans to go into the land of Canaan, but when they came to Haran, they settled there. The days of Terah were 205 years, and Terah died in Haran. Today we begin the story of Abraham, possibly the most important person in the Old Testament after Moses and one who, like Moses, led an adventuresome life. It is important to keep in mind just how old this history is. The events occur close to the dawn of civilization, when there were only a few very small areas, centered on rivers, which had begun to show strong attributes of civilized society: Egypt (Nile), Mesopotamia (Tigris-Euphrates), China (Yellow R.) and India (Indus R.). Ur of the Chaldeans was the southernmost city of what was likely still the Sumerian Empire, although nobody is sure precisely when Abram lived; the accounts of this section of Genesis are unique and there is practically no other written history of Canaan at that time. The Sumerians had an archaic form of writing, but it was not used to write books; the only written history of the time is the occasional brief account of a great ruler. Thus, the history of Abraham was passed from generation to generation orally. His importance is demonstrated by the great detail preserved in the oral history, such as the names of minor kings which would be unknown except for Genesis. Genesis is, and will always be, full of mystery. Nobody even knows how the length of lives were calculated, although Terah certainly did not live for 205 years in the modern sense. Calendars were primitive; a reliable calendar was not invented in the West until Rome adopted the Julian Calendar in 45 B.C. A Sumerian year was probably equal to four or five of our months. Terah's reasons for leaving Ur or stopping in Haran are not known. One could imagine a motivation similar to American pioneers traveling to Oklahoma or Oregon; there were fewer people and cheaper land. It was their land of opportunity, away from the hidebound society of Sumer.